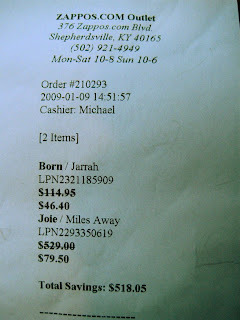 When I look at this receipt, I see not the money I spent, I see only the money I saved. $518.05! Are you kidding me? I feel so crafty and pleased with this amount "saved" that it completely negates the fact that I don't need any more boots for approximately six years. The fact that I would never pay $529 for a pair of boots is a non-issue. So what if I consider buying boots that expensive a criminal act akin to telling the Amazonian Indians that I can drill oil from their rainforest because they only own the SURFACE and somehow forgot to mention that in the treaty we signed. I recall walking down Wiener Strasse in Berlin with Charlie this time last year. He told me about the haute couture boutique he worked at in Melbourne and the thousands of dollars customers paid for one piece of a designer's clothing. "What the hell is it spun with?! Gold?" I asked, shocked. "Genius, darling!" Charlie said. "It's spun with genius." I don't know if it's genius that I now know that the Zappos outlet is within driving distance from my house but I'm going to gloat every time I wear my bargain hunter handcrafted Italian boots to Steak 'n Shake. the most important part of this is... how did we not know there was a zappos outlet in KY and why don't we go there every time i'm in cinci??? ?